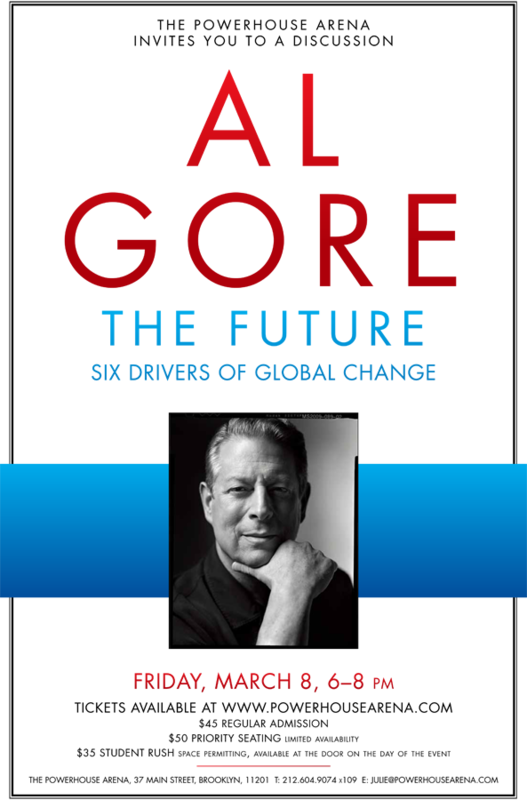 Join us as former Vice President Al Gore discusses his latest book, The Future: Six Drivers of Global Change. This visionary investigation of the forces that shape global change is the Nobel Peace Prize recipient’s forecast for the future. Moderator TBA. Ticket purchase guarantees an autographed copy of the featured title. $50 priority seating (limited quantity available) SOLD OUT, $45 regular admission. Space permitting, student rush tickets ($35) will be available at the door on the day of the event. Online and phone ticket sales are no longer available. There are still a limited number of tickets available in person on a first come, first served basis at The POWERHOUSE Arena. We are at the dawn of a “new future.” Ours is a time of revolutionary change that has no precedent in history. In the past, the future has always appeared before us as an extension of our paced evolution. But now we are suddenly racing toward it and it is remarkably complicated and different from anything we’ve seen before. With the same passion he brought to the challenge of climate change, and with his decades of experience on the front lines of global policy, Al Gore surveys our planet’s beclouded horizon and offers a sober, learned, and ultimately hopeful forecast in the visionary tradition of Alvin Toffler’s Future Shock and John Naisbitt’s Megatrends. 1. Earth, Inc. Ever-increasing economic globalization has led to the emergence of what Gore labels “Earth Inc.”—an integrated, holistic entity with a new and different relationship to capital, labor (outsourcing and robo-sourcing), consumer markets, and national governments than in the past. 2. Global Mind The worldwide digital communications, Internet, and computer revolutions have led to the emergence of “the Global Mind,” which links the thoughts and feelings of billions of people and connects intelligent machines, robots, ubiquitous sensors, and databases. 3. Shift in Balance of Power The balance of global political, economic, and military power is shifting more profoundly than at any time in the last five hundred years—from a U.S.-centered system to one with multiple emerging centers of power, from nation-states to private actors, and from political systems to markets. 4. Growth A deeply flawed economic compass is leading us to unsustainable growth in consumption, pollution flows, and depletion of the planet’s strategic resources of topsoil, freshwater, and living species. 5. Reinvention of Life and Death Genomic, biotechnology, neuroscience, and life sciences revolutions are radically transforming the fields of medicine, agriculture, and molecular science—and are putting control of evolution in human hands. 6. Relationship between Humanity and the Earth There has been a radical disruption of the relationship between human beings and the earth’s ecosystems, along with the beginning of a revolutionary transformation of energy systems, agriculture, transportation, and construction worldwide. From his earliest days in public life, Al Gore has been warning us of the promise and peril of emergent truths—no matter how “inconvenient” they may seem to be. We’re already in the early stages of the six emergent drivers of change described in THE FUTURE. They are beginning to transform our planet, our civilization, the way we work and live our lives, the degradation of self-governance, the fabric of life, the species with which we share the earth and the physical, mental and spiritual nature of humanity. Gore writes that we have a choice. We can be swept along by the powerful currents of technological change and economic determinism into a future that may threaten our aspirations and values or we can build the capacity for collective decision-making on a global scale that allows us to shape the future in ways that protect human dignity and reflect the aspirations of people and nations throughout the world. Mapping the future is a risky undertaking but perhaps the only thing riskier is doing nothing. Former Vice President Al Gore is a co-founder and chairman of Generation Investment Management. He is also a senior partner at Kleiner Perkins Caufield & Byers, and a member of Apple Inc.’s board of directors. 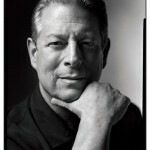 Gore spends the majority of his time as chairman of The Climate Reality Project, a nonprofit devoted to solving the climate crisis. Gore was elected to the U.S. House of Representatives four times and the U.S. Senate twice. He served eight years as vice president. He authored the bestsellers Earth in the Balance, An Inconvenient Truth, The Assault on Reason, and Our Choice. He is a co-recipient of the 2007 Nobel Peace Prize.